Thank you for your purchase and investment in Alaska's fish and wildlife! Your money directly supports ADF&G’s management and research of Alaska’s fish and wildlife resources. Buy fishing, hunting, trapping, crewmember and guide licenses, big game tags, duck & king salmon stamps. Prices, age & residency requirements & how to purchase by mail. Sport and commercial crewmember licenses, big game tags and stamp statistics including revenue collected and number sold. Information for sport fishing guides, big game guides & transporters, fur dealers, taxidermists, game farms, and wild animal control. Information for businesses or individuals who sell licenses, stamps, and locking tags. 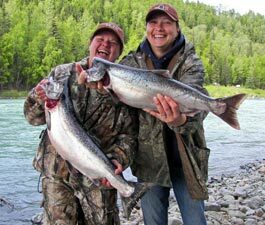 Information about sport fishing licenses and king salmon stamps. Information on subsistence, and personal use fishing permits. License & permits information for crewmembers, catcher-sellers, buyers, processors, & transporters. Information on salmon hatchery permits. Information on aquatic farming permits. Information on General Season, Drawing, Registration, Subsistence (Tiers I & II) licenses, tags, & permits. Information and permits for McNeil River, Round Island, & Pack Creek. Information on Fish Habitat and Special Area permits for building roads and bridges, mining, & other lands and water uses. Scientific & educational permits, auction permits, possession of non-native animals, cultural permits, Defense of Life & Property, hazing, and falconry.